Distribution and habitat: Schizachyrium scoparium is one of the dominant grasses which grow in the rich and fertile soils of the tallgrass prairie. 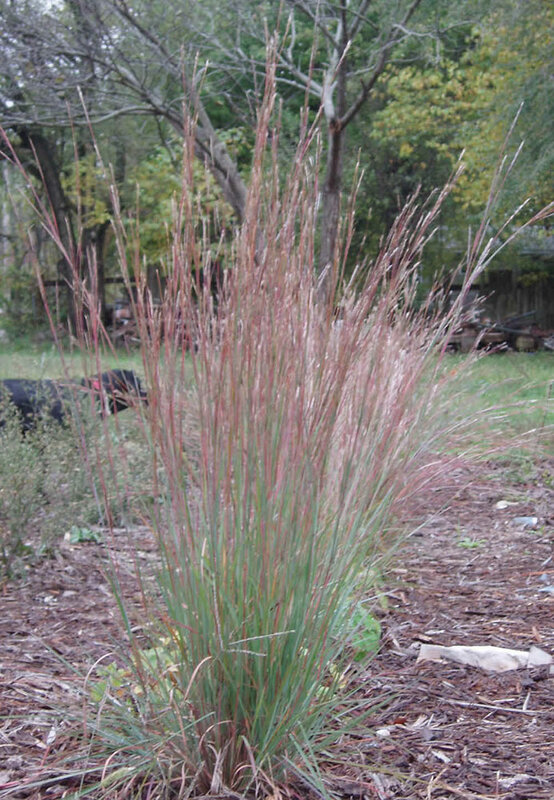 It is a Missouri native, warm season, ornamental grass which typically grows 0.6-1.2m (2-4 feet) tall (less frequently to 1.5 (5 feet)) and occurs in prairies, open woods, clearings, glades, roadsides and waste areas throughout most of the North America. Description: Schizachyrium scoparium grows to a typical height of 1m (3 feet). Although it has a blue tint in the spring, in fall, its predominant color is more red, which color it may retain throughout winter into spring. Forms upright clumps of slender green leaves (0.6 cm (0.25 inch) wide) with a tinge of blue at the base. Purplish-bronze flowers appear in 7.5cm (3 inch) long racemes on branched stems rising above the foliage in mid-summer. Resulting clusters of fluffy, silvery-white seed heads are attractive and may persist into winter. Most outstanding feature of this grass may be the bronze-orange fall foliage color. Schizachyrium scoparium is a warm-season grass, it would not start growing until mid to late spring or even early summer. Gardening: Schizachyrium scoparium is a moderate grower, drought, heat and frost tolerant. If necessary, plant or transplant Schizachyrium scoparium bare root only in late spring to early summer or in fall, when the soil is warm, as the roots will grow only in warm soil. Planting too early in the spring may cause the roots to rot. If planting too late in the fall, the roots may not grow enough to establish before the cold and wet of winter, resulting in the demise of the plant. Trim close to the ground in late winter to early spring. Avoid over watering and over fertilizing. This can cause flopping and weak tissues that can lead to disease. Position: Place the Schizachyrium scoparium in full sun only. Soil: It tolerates a wide range of soil conditions: sandy, sandy loam, medium loam, clay loam, clay or limestone-based soil. It prefers well-drained soil. One variety, Schizachyrium scoparium var. littorale, is adapted to sand dune habitat. Water: It has average water needs: dry to medium. Water regularly, once every 2 weeks; do not overwater. Once established, Schizachyrium scoparium has high tolerance to drought, but it will not tolerate wetlands or sub-irrigated sites. Excessive moisture and fertile soil will cause the tall flower stems to fall over. Fertilising: Fertilising Schizachyrium scoparium is generally not needed. Fertilizer causes lush growth that requires more water. If fertilization is needed, a slow release fertilizer can be applied in the spring. Propagation: Schizachyrium scoparium can be propagated by root division or seed collected in late autumn. Seed are commercially available. Sow seed in fall or early winter. Divide the clumps only in spring when it shows first signs of life in the spring, continuing until the new growth is about 30cm (12 inch) tall. Uses: Schizachyrium scoparium grows in clumps, used as fall conspicuous or accent in meadow style garden. It is excellent for borders, cottage gardens, wild gardens, native plant gardens or prairie-like settings. It is suitable for group or mass planting in beds and borders, used as ground covers, dried flower, naturalizing, roadside, specimen plant or landscape focal point. Works well in rain garden settings and helps with erosion control. Drought-tolerant the Schizachyrium scoparium is suitable for xeriscaping. Winter interest: Schizachyrium scoparium is wonderful planted ‘en masse’. The visual dynamics it provides range from blue-green in late summer to golden with cotton-tufted seedheads in winter. Cut the dried flowers for a winter bouquet which will look stunning when placed in a vase in front of a window so the delicate flowers will be backlit.